We launched, we paddled north, and we went right to the spot at which I caught fish last time. 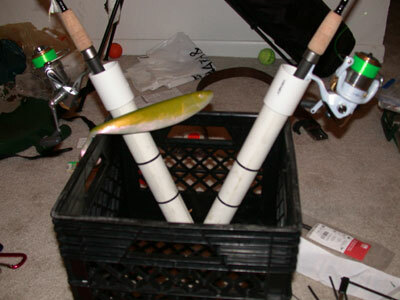 I caught one fish on my little pivoting crankbait (see image below). I switched to a "jerkbait" and treated it like it was a jig (raise the rod, lower and crank in the slack, rest, repeat) and tagged two more, both slightly bigger than the first fish (which itself was about 12"). We're still not sure what kind of fish this is. The picture here makes it look a bit paler than it was in real life. The fish is actually much pinker/oranger with darker green stripes. My thumb is covering up a lack spot that existed on all three fish. 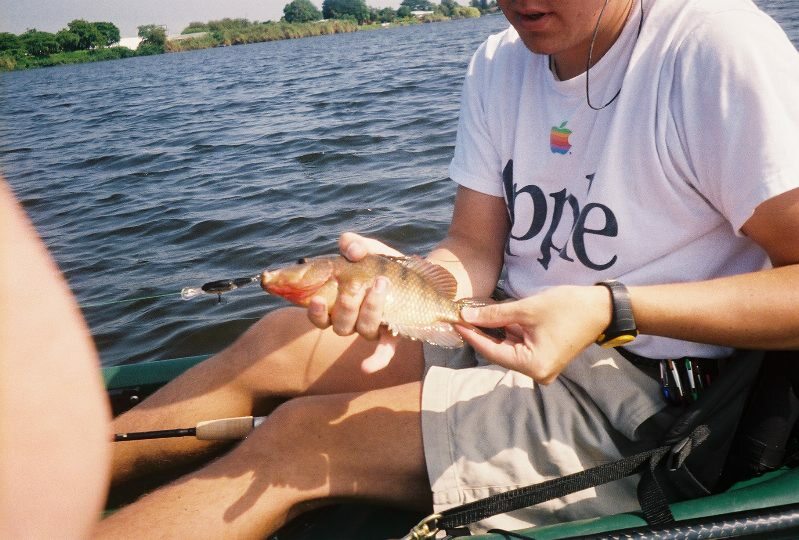 We paddled around for a bit, fished with some spoons and other lures, but the only thing we caught the rest of the afternoon were José's tree (lost the lure) and lily patch (recovered the lure). He did have a few hits on the crankbait earlier in the day. José and I then went shopping. I picked up a Medium/Light two-piece Redbone at 7 feet for José, primarily, but also for my dad when he gets back. The Mitchells he gave me are too whippy to cast well. They troll well, they jig well, but they don't cast well at all. These Redbones have a lot more giddy-up, and at $49.99 - 20% (normally $90), I couldn't pass it up. Next, José and I rigged up our kayaks a little bit. Here are two images. The first shows the "Rodholders in a Milk Crate" I've rigged up (that's my rubber fish, Darwin, hamming it up for the camera), and the second shows the additional four "inchworms" (deck loops) José and I each added to our kayaks. 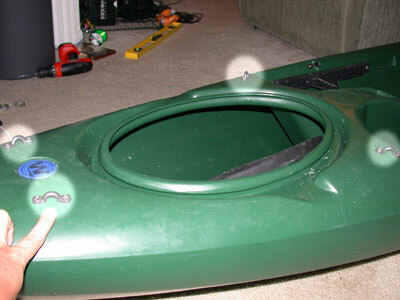 We'll criss-cross some bungee ("shock cord") through them and that'll serve two purposes: to keep our hatch down (which isn't really a problem) and, more importantly, to provide a quick "paddle park" for those times when you need to secure your paddle to your kayak quickly (i.e. "fish on!"). All told, I'm fairly disappointed. José got a bit upset that he was casting poorly (he improved quite quickly, if the truth is told). I am upset at myself for not getting him into fish. He's got a lot to learn (as do I about fishing in Florida, even freshwater). I'd never used a plastic before, and I caught 67% of my fish today on them, even though I was using them improperly! Still no bass, though, and that's puzzling. Next time: live bait. He'll have to get into some fish then! It's a near guarantee in any water! 3 Responses to "Fishing Lake Ida with Ramos"